Sure Step franchise business opportunity. Free Sure Step business franchise information. On a rainy day, the entranceway of every store and office building becomes a danger zone - for customers and staff. Every marble floor that has just been mopped, every kitchen in every restaurant or school cafeteria; every bathtub in every hotel, every washroom floor with a few drops of water - all these places and more are legal battlefields. 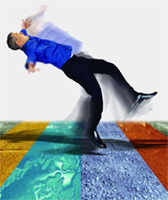 Sure Step is the answer to wet dangerous floors that business owners are looking for. There is no better solution. Period! Interlake Chemicals is pleased to offer you the exciting and profitable Sure Step Distributorship Program. A Sure Step floor increases the coefficient of friction when a floor or surface gets wet. The result is that your foot will no longer slip out from under you. The higher coefficient of friction makes it dramatically more slip-resistant - and therefore, safer. A clean process - Sure Step is not a film or a coating. Nor does it leave any chemicals, grit or residue on the surface of the floor or bathtub. Once treated, 100% of the solution is neutralized and then removed. Floor and bathtub friendly - A Sure Step treatment will not cause chipping, peeling or discoloration. In fact, a Sure Step floor and bathtub will look brand new again. Floor and bathtub guarantee - Every floor and bathtub treated with Sure Step is guaranteed to have an increased coefficient of friction for at least one to five years. And we back it up with a written guarantee. "I received my full investment back within the first month. I had no idea I would make such a profit so soon." - Grant W.
"I got my first treatment right then and there to do over 3,000 square feet of floors and its been non-stop ever since." - Ryan P.
Interlake protects your territory…We limit the number of distributorships we sell in any area and we give it to you in writing. In a medium-sized city - you could be the only Sure Step distributor. To learn more about the Sure Step franchise opportunity, simply complete the form below.